This apartment which has about 40 m² is suitable for accommodating up to 3 guests. It has an entrance hall, a combined livingroom-bedroom, a fully equipped kitchen, a bathroom and a separate WC. The livingroom/bedroom combination: with a double bed, bed linen, specious wardrobe, a living area with a sofa (which could be used as bed for two persons), coffee table, Cable TV, Hi-fi stereo system, CD player, and a telephone. The 24 hour broad band Internet access is provided. 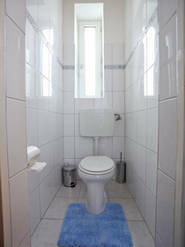 The bathroom has a shower, wash basin, washer and dryer, hair dryer, iron / ironing board, towels and a separate WC. The kitchen/dining area: is fully equipped with electric range and oven, dishwasher, refrigerator with freezing comportment, toaster, microwave oven, coffee making machine, utensils and other necessary table ware, kitchen ware and a dining table for four.